Otto Piene was born in Laasphe in Westphalia in 1928 and grew up in Lübbecke. After military service and war captivity Piene began his studies at the Blocher School and at the Kunstakademie in Munich at the age of 20. Two years later he went to the Kunstakademie in Düsseldorf where he was enrolled until 1953. Then followed a four-year degree in philosophy at the university of Cologne. Piene began studying the element of light in art around the mid 1950s. He had exhibitions from 1955 onwards, first group exhibitions and, in 1959, his first one-man exhibition at the Galerie Schmela in Düsseldorf. Together with Heinz Mack Piene founded the group ‘ZERO’ in 1957. The group was later also joined by Günther Uecker. Until 1961 the three artists published the art journal ‘ZERO’. The group organised numerous ZERO-exhibitions between 1961 and 1966. They exhibited a ‘ZERO Lichtraum’, a joint work of the three artists, at the documenta III in 1964. 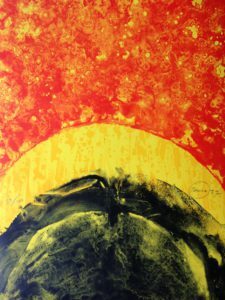 In the same year Piene accepted a teaching post at the University of Pennsylvania for four years. He then went to the Massachusetts Institute of Technology (M.I.T.) in Cambridge/USA where he became professor of environmental art and from 1974 to 1993 he was the director of the Centre for Advanced Visual Studies (CAVS). The Museum am Ostwall in Dortmund arranged the artist’s first retrospective exhibition as early as 1967 and he was invited to present his objects once again at the documenta ten years later. Piene became a member of the council of the Zentrum für Kunst und Medien in Karlsruhe in 1990. Since 1994 he has been Director emeritus at the CAVS/MIT. 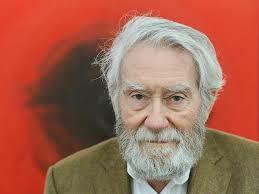 Otto Piene lives and works in Düsseldorf, Boston and Groton, Massachusetts. Piene became known with his light-kinetic works, particularly the light ballet, in which the artist tries to find a link between nature and technology. His intense study of light, movement and space is also reflected in his technically rather different grid and fire pictures the artist has been experimenting with since the 1960s, as well as in his air and light sculptures and his sky events.